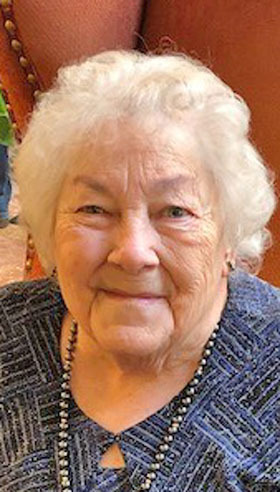 SALEM – Agnes Aurelia (Fink) Roelen, 86, died Thursday, April 11, 2019 at her home. She was born Jan. 2, 1933 in Salem, the daughter of Frank and Erma (Englert) Fink. Agnes was a 1951 graduate of Salem High School. She played the piano and bass clarinet and was a proud member of the marching band. Before her marriage, Agnes worked at the Farmers National Bank. On June 12, 1954, she married Henry (Ben) Roelen, and celebrated 65 years of marriage in 2019. Through the years, Agnes enjoyed watching her children participate in sports and was proud of all their accomplishments. She had a green thumb and could make any plant thrive. Eventually, an interest in antiques blossomed and then became passionate about collecting, buying and selling anything old. Her hobby became a business which she enjoyed for over 50 years. Agnes was an active member of St. Paul Catholic Church for her entire life. Survivors include her husband Henry; children, Lisa (Ethridge), Zane, Jay, Patrick, Damian, Bridget (Frank); and seven grandchildren. A memorial mass will be held at 11 a.m. Monday, April 15, 2019 at St. Paul Catholic Church with Father Robert Edwards officiating. Friends may be received from 10 to 11 a.m. at the church. Agnes’ obituary may be viewed, and condolences sent online at www.starkmemorial.com.